Help!!!! How do I finish this??? Thread: Help!!!! How do I finish this??? First off---I am not very good at asking for HELP!!! That being said---HELP!!!!! I am just finishing a big (for me) applique project---the big part is the appliques themselves. The pieces are 7" X 7" ish and I don't know how to quilt the whole thing!!!!! And forget doing anything on my DMC!!!!! It is difficult enough wrestling to put the binding on!!!! I guess my question is: can I just squiggle my way across all appliques like they were not really there??? I would think that since they are large and somewhat abstract (not tiny and detailed) it should work to just do your normal quilting. I'm no help at all ~ but I really like it! Great job! That quilt is sew cute! I think if you just did a simple quilting design all the way across like regular quilting it would be fine. I did a similar quilt with large appliques and I had my quilter use transparent thread so the thread color would not be distracting. Meander and have fun with it. I would use a light gray or tan very neutral thread. The top right cat hanging upside down is clearly my favorite. Love the quilt. did you attach the applique with stitching?. I can not tell . Simce the blocks are not yet sewn together you could quilt as you go and either fancy stitch on the applique or do a echo around each cat/mpouse/letter and then SID on the star. Also what does your batting say for recommended distance.? I think there are some out there that say 6" so that means that you could do simple wavy lines around inside of each block. Question- Do you need to attach applique with stitching AND iron on stuff? Love the kitties. I'm not great with quilting designs, so I can't add any more to what has already been posted. Thank you all for your help!!! Knowing that I CAN just quilt as normal THROUGH the appliques gives me great hope that I will do a good job of it!!! 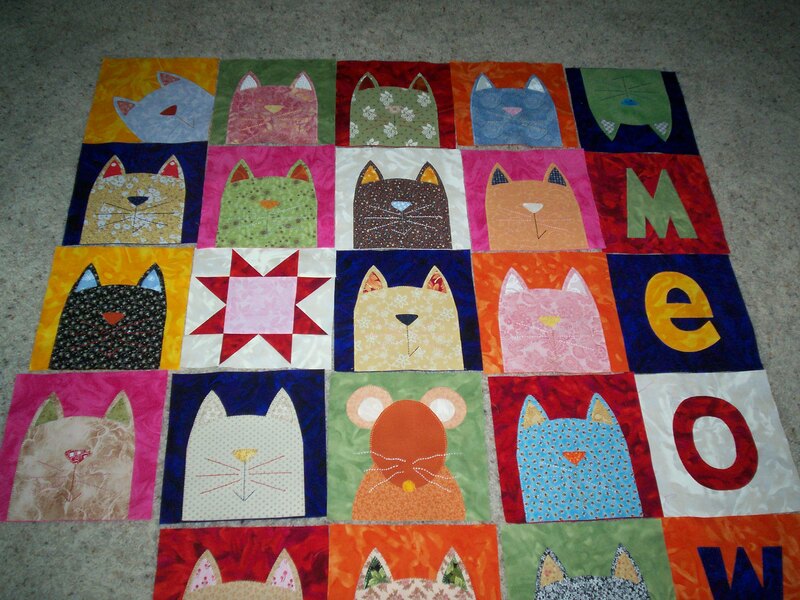 Big sis---the cats et al were fused and stitched down and the blocks are all sewn together now!!! Just have to do the border!!!! The batting will be Warm & Natural---that is why my question--because they say 5" for that and the cats are bigger than that!!!! Your quilt is beautiful!!! I am envious. I think it is the best cat quilt I have seen. such a cute quilt top. Can't wait to see it quilted. Any kind of quilting makes the quilt so much better. I think an all over stipple would look great. First, I really like it. I think eyes give animals personality, so I'd recommend giving them eyes. I think a meander with injections of mouse, bird, fish, cheese and other cat/mouse related figures would do for quilting. Love the quilt! Yes, you can stitch through the applique...and that's all I know. Not very good at the machine quilting ideas. Basically I do a straight stitch or echo kind of quilting. I like the playfulness of your quilt. Cute! The eyes are buttons...they will go on after quilting!!! I am no help with the quilting but your quilt is soooo cute. Love the mouse. I think whatever you decide to do will be great! I don't really have any advice for you: sorry! But I hope you post a photo when you have completed it! I think echo quilting would really punch up the kitties. Love the cats but the one mouse made me smile. I would quilt around the shapes shadow or meandering. If the batting says 5" then you can stitch 1" inside each block and be safe. I do not have a long arm but have heard that SID is much harder to do than meandering /stippling on a long arm. This quilt is so stinkin' cute! Another one I'd like to make. Please post a picture once you're done. I put on all buttons with my machine! Drop the feed dogs, set to a zigzag stitch of appropriate width to hit the holes and go! So fast and I never stick my finger with the needle! Such a cute, happy quilt. Just a thought, why not use different textures for the cats themselves and quilt the background in a simple meander? What every you decide be sure and show us.